On 10th March 1905, in an upstairs room at the Rising Sun pub, Chelsea FC were formed. The South West London club completely re-shaped their history in 2012. When they lifted the ‘UEFA Champions League’ following a 4-3 penalty shootout triumph against German footballing giants Bayern Munich. Three time Premier League champions, Chelsea football club, approached Cafe Reality to organise a renovation of their ‘Zola hospitality suite’ (in honour of the little Italian magician that is Gianfranco Zola). After a meeting between the two parties, it became clear that image was key to this sporting giant. Class and elegance was the main criteria, very similar to Zola himself. It was imperative that the furniture reflected this image as well as being robust and built to last. During the meeting, we developed an understanding of which furniture would be best suited to the criteria given. After some deliberation, both parties decided to proceed with the ‘Nottingham Leather Bar Stools’ together with dark brown poseur height tables. The classic leather design and solid wood frame on the bar stools were a perfect match, coinciding with the panoramic views of South West London. The dark finish on the tables coordinated with the bar stools which continued the contemporary look that was created by the surrounding décor. 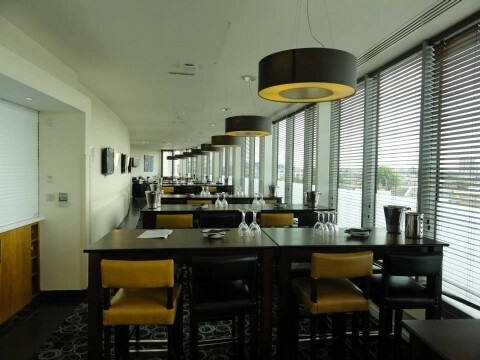 The Zola suite at Chelsea F.C. is now suitable for match days and creates the perfect setting for a pre-match meal as well as post-match drinks. We managed to grab a quick word with Charmaine (Facilities Manager) after installation. When asked about the furniture and the project overall she gave us this response “I have purchased furniture from Office Reality before and found the order process to be very efficient, staff are very polite and orders are processed In a timely manner. On receiving my goods for several areas around the site, all furniture installations were on time, well packaged and installed to a very high standard. I would use this company again”.